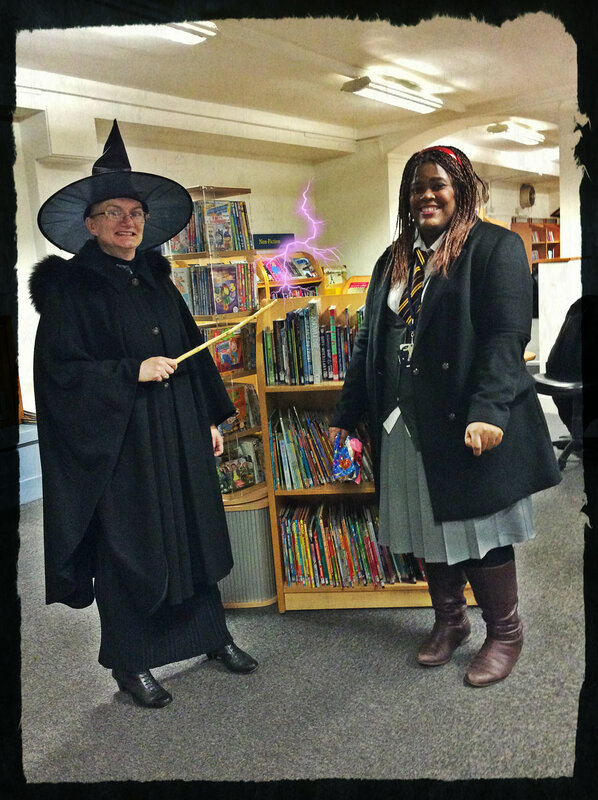 Comic Fun at Brompton Library! 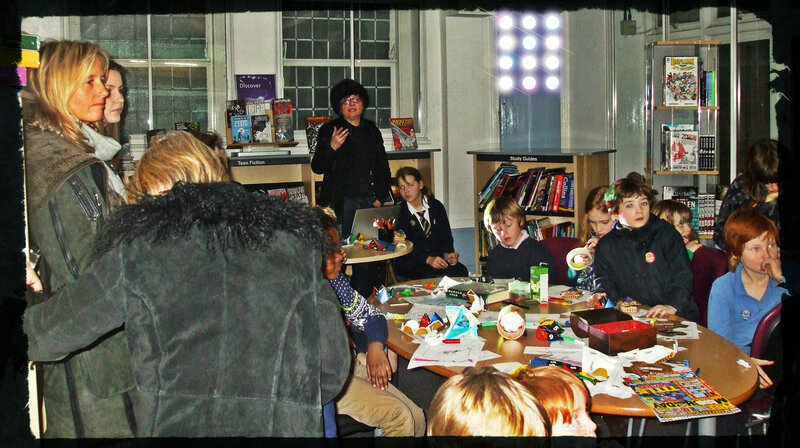 An intrepid and curious band of children and adults rocked up to Brompton Library to discover the ins and outs of designing cartoons from scratch! We were guided by cartoon artist John Byrne who in next to no time got us recreating and producing our very own masterpieces. 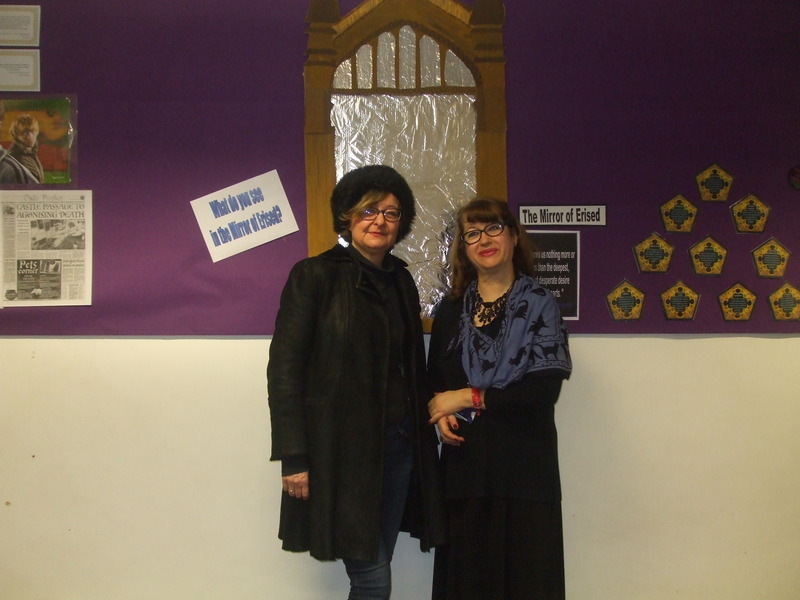 Valentine’s Day at Kensal Library! During Saturday’s craft session we made these very cute Valentine Bears. Aren’t they lovable? 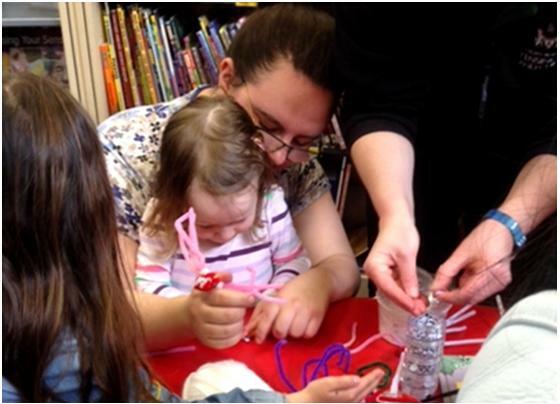 This month Notting Hill Gate Library has been very engaged in new activities, such as having our first ever Story Time session. We read a range of books and even had a dance when reading “Were Going on a Bear Hunt” by Michael Rosen. 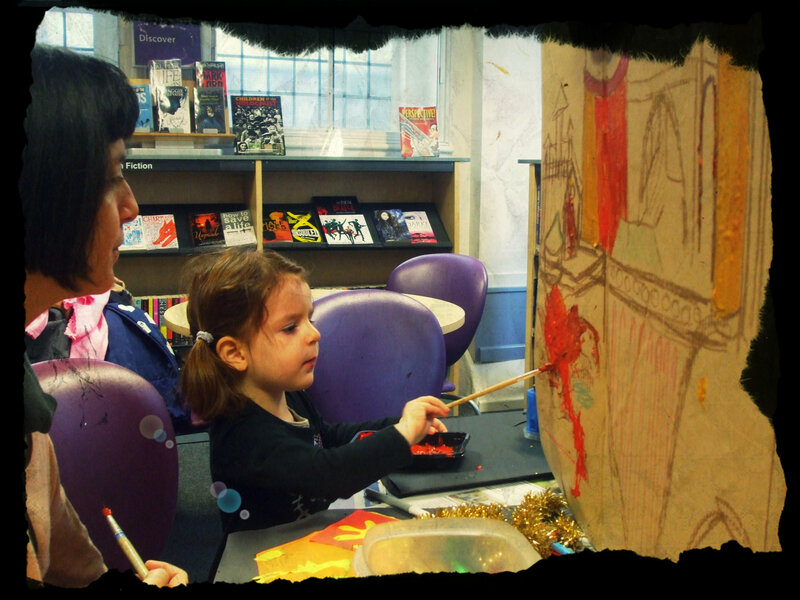 Our second Story and Craft session took place on Saturday 21st November. 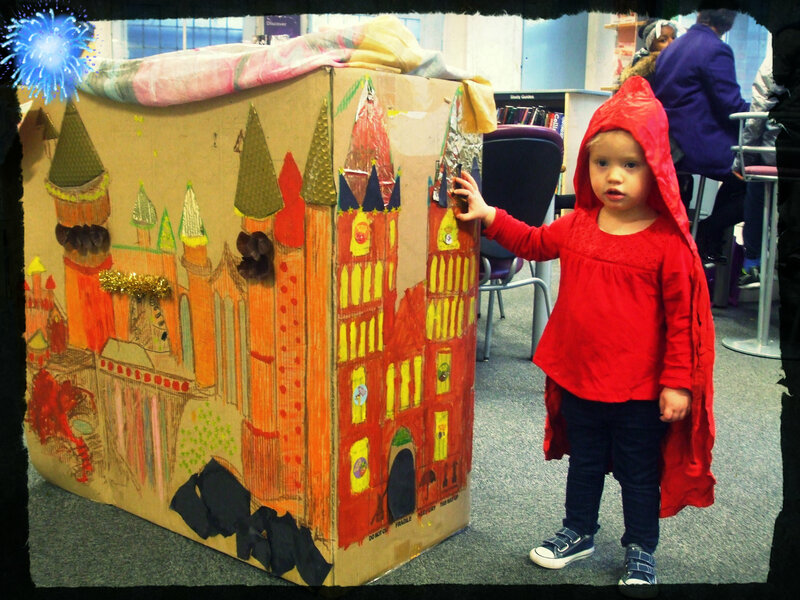 The library was transformed into every child’s dream, where everyone had the chance to become a superhero. It went with a BOOM and a BANG! Snow visited us with a cold start to the day, however this did not stop our brave, dedicated superheroes! They forgot their masks so we made them by using all sorts of materials and quickly put them on to hide their identities from the world. As you can see in the picture they were all unique designs, some were inspired by their iconic superheroes for instance ‘The Incredibles’. As in all parties, we celebrated by marking the event in our Superhero Photo booth of the bold Batman and dazzling Wonder Woman. The superheroes were smiling from ear to ear, exciting stuff! Parents were supportive of their mini superheroes by generously donating fruits, which the children used to create their own superhero faces. Two of the children did not know what a Pomegranate was, but once they had tasted the delicious fruit, they were hooked. The day was saved when all our mini-superheroes came to the rescue by using their powers to help tidy the children’s library. It was a hard days work! Well, they certainly did! 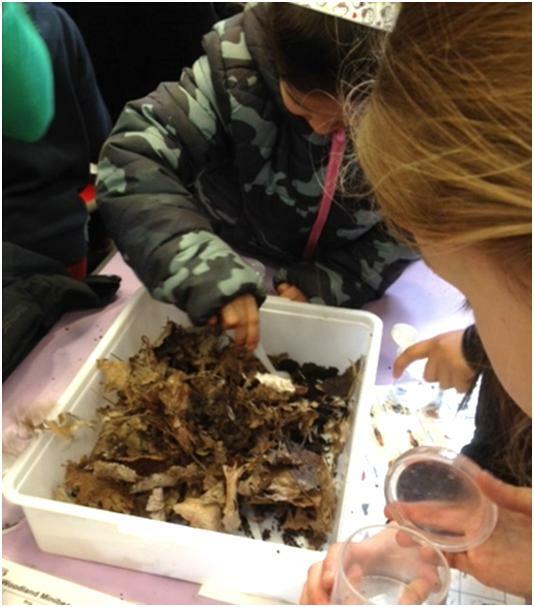 Brompton hosted Holland Park Ecology Centre’s children’s event with what the Ecology Centre call “exotic invertebrates” but most of us would call creepy crawlies or, perhaps a little more kindly, minibeasts. Fiona and Sadie set up one table with the larger, non-native bugs and one with some soil and foliage that the kids could rummage through to find the smaller, more familiar garden bugs and then study them in containers with magnifying lids. They couldn’t have been more fascinated. I was very pleased that after exhausting the possibilities of the live bugs a lot of children then went on to make some wonderfully creative multi-coloured spiders with ridiculous numbers of eyes from the pipe cleaners and other parts supplied by the centre. This really was the most popular event I’ve ever witnessed at Brompton and the buzz and excitement were almost tangible. A big thank you to Fiona and Sadie and to the Ecology Centre for the great work they do! 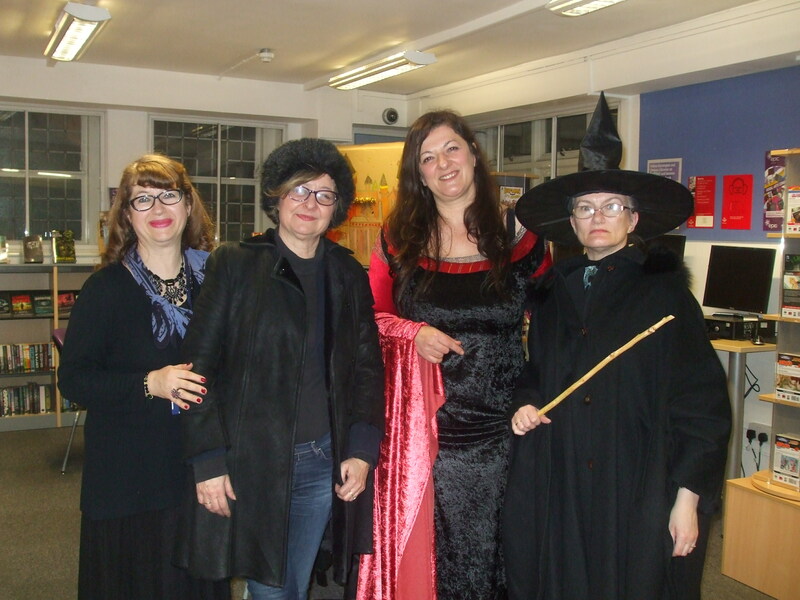 On Thursday 5th February 2015, North Kensington Library joined the thousands of Muggles, Witches, and Wizards that convened across the UK to celebrate the very first Harry Potter Book Night. Unbelievably, it has been seventeen years since the first publication of “Harry Potter and the Philosopher’s Stone”. In that time, Harry Potter has evolved into a global phenomenon that has touched and inspired a generation. 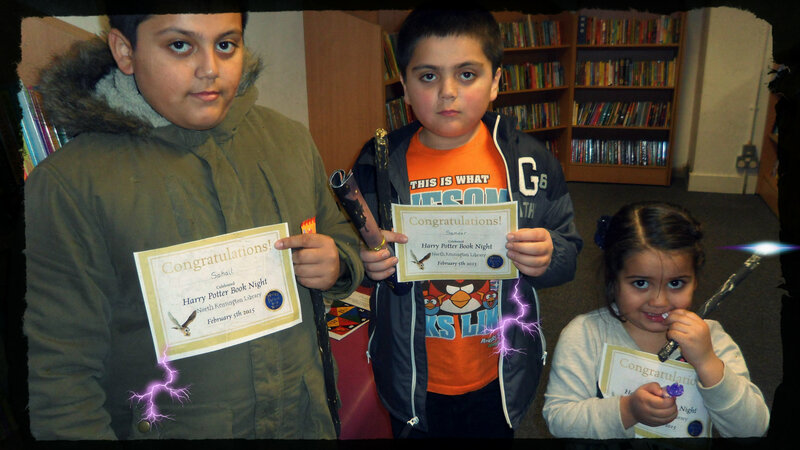 Harry Potter Book Night was a great opportunity for fans old and new to share their knowledge, learn new tid-bits, and celebrate this enchanting story. It was also a brilliant and exciting way to introduce prospective readers to the franchise. There were so many great moments, both in the planning stages and during the actual event. Here is a summary of some of the mischief managed! 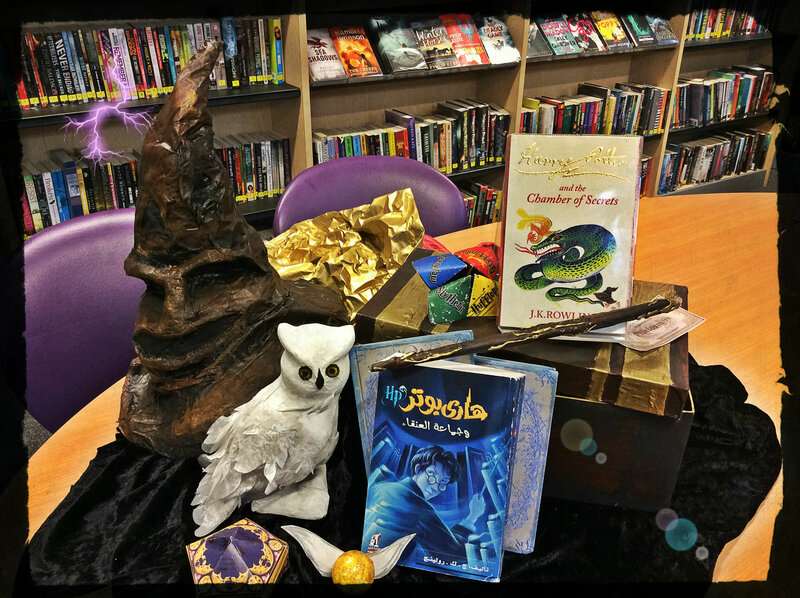 I drew inspiration from some of the most iconic scenes in “Harry Potter and the Philosopher’s Stone” to form ideas on how to best transform the Children’s library into a little piece of the Wizarding world. From “Chocolate Frogs” to “Bertie Bott’s Every Flavour Beans”, we had some of the best wizarding confectionary on display in our window. 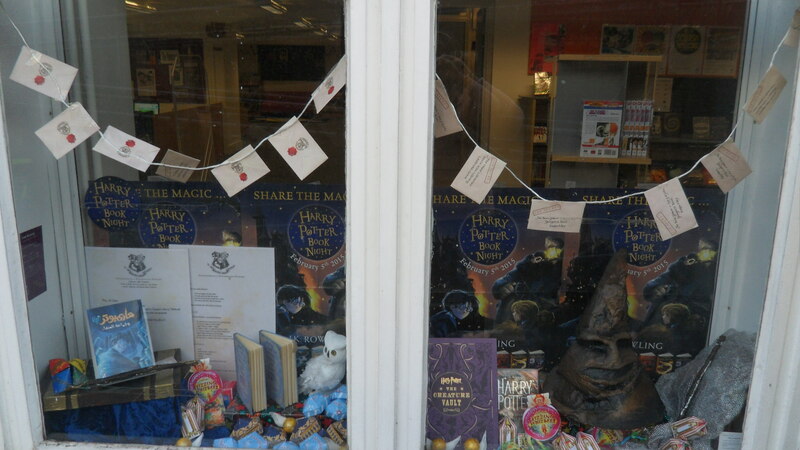 Although the actual chocolate frogs were nowhere to be seen, we did remember to display our collectible wizard cards. 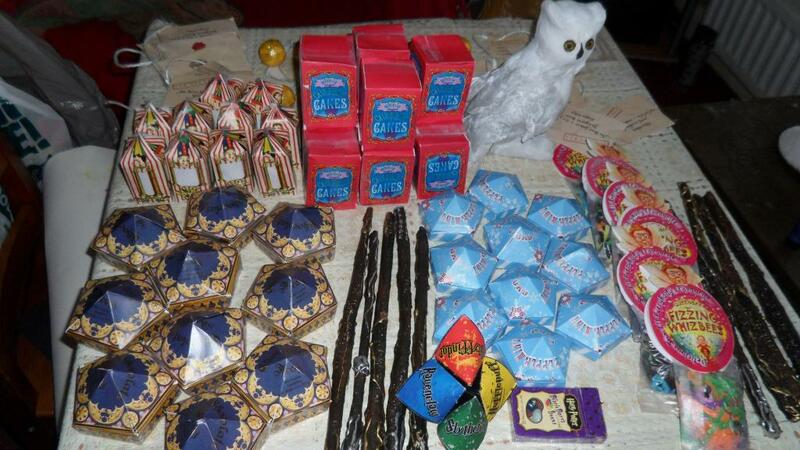 The handmade wands we produced were pretty impressive; they came in different colours, a variety of cores (dragon heartstring, unicorn hair and phoenix feathers), different sizes, and were at least two Galleons cheaper. Ollivander, the famed wand-maker, had better watch out! Zvezdana Popovic, our senior customer service assistant, created a charming version of the Mirror of Erised. In the book, the mirror is described as being able to show people their hearts’ deepest desires through their reflection. For Harry, who has never known his parents, this desire manifested in a vision of a loving family with living parents. Visitors to the library were encouraged to look into the mirror and share what they saw looking back at them. 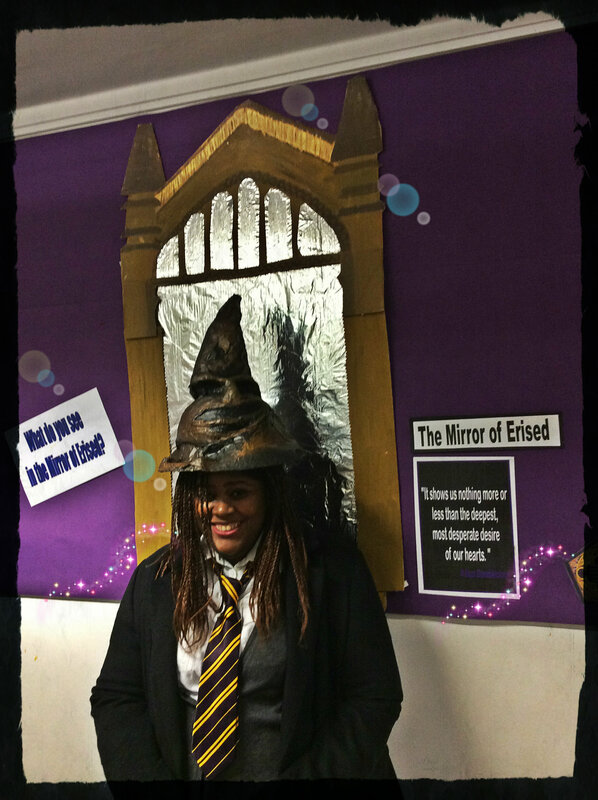 Of course, no Philosopher’s Stone celebration would be complete without a Sorting Hat. 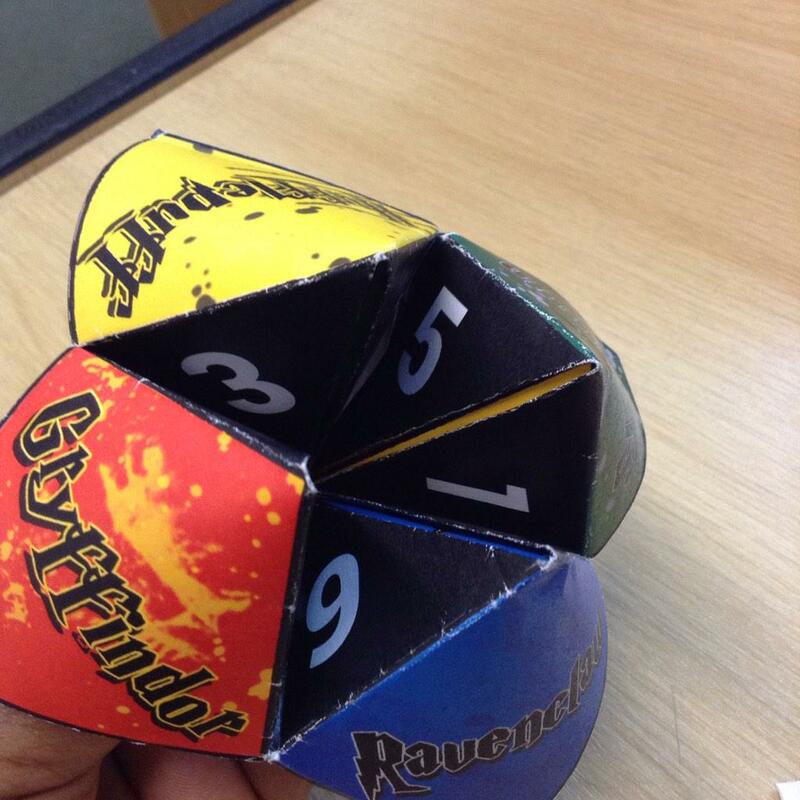 I made our Sorting Hat from newspaper, mod rock and a copious amount of glue. It took two weeks to make all the props and although it did get a bit messy, it was not only great fun but also incredible to see the faces of the children who saw everything for the first time on the day. 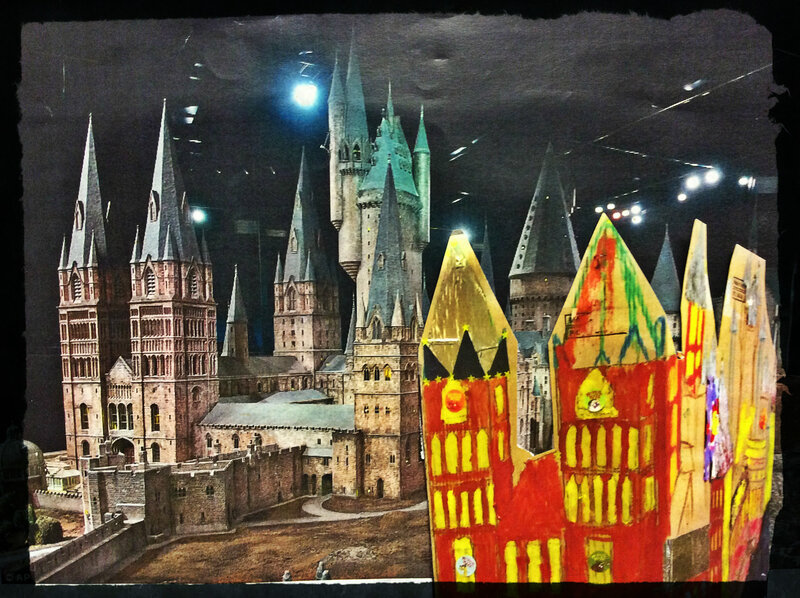 If you knew anything about the architecture of Hogwarts, forget it. Ours was actually built during our January Story and Craft session. Led by Zvezdana, the attendees were invited to help design and construct their very own School of Witchcraft and Wizardry. The Billards, one of the families in attendance, helped to design and decorate one of the castle’s sides. I can hardly tell the difference between ours and the one used for the movies – it is just that great. Happily, the family also came along to the main event and posed for some lovely photographs in front of their hard work. Zvezdana brought a chest full of wonderfully magical looking cloaks, robes and cloths that the children wasted no time in using to dress up in. 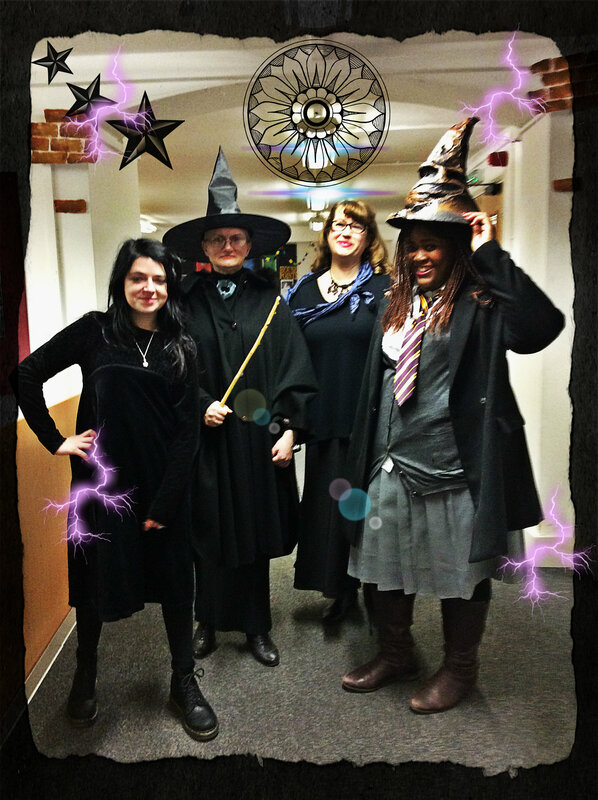 Likewise, we staff members had a lot of fun dressing up for the event. 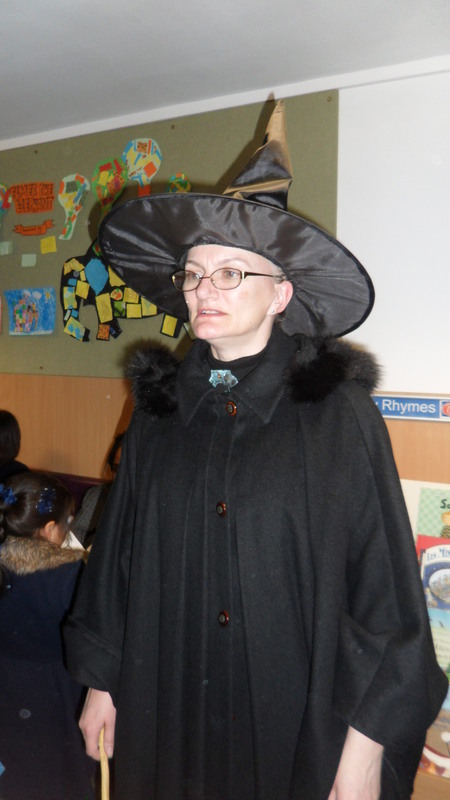 Lynn Terrel (Kensington Central Library) looked the part in a very McGonagall-esque outfit that had many children exclaim excitedly upon her entrance. Silva Memic, Sophie Rose and Zvezdana all looked great in their velvety magical ensembles and I did my best impression of a Gryffindor student (although obviously, it was a bad decision as I quickly received a rather stern telling off from one young witch for failing to choose Ravenclaw as my house – maybe next year?). 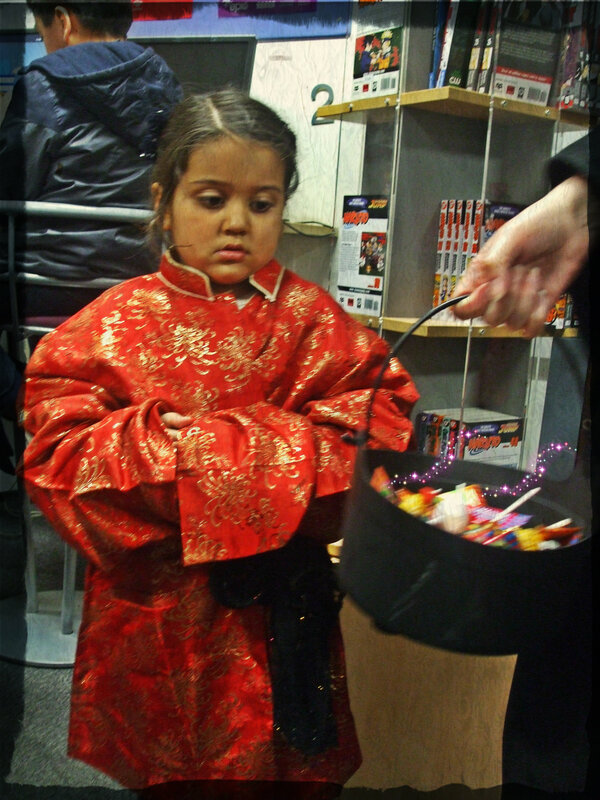 Without a doubt, the best dressed of the night had to be the young wizard who came as a young Harry Potter. He looked absolutely fantastic in his Gryffindor robes and took it like a champion even when he was subsequently sorted into Slytherin. 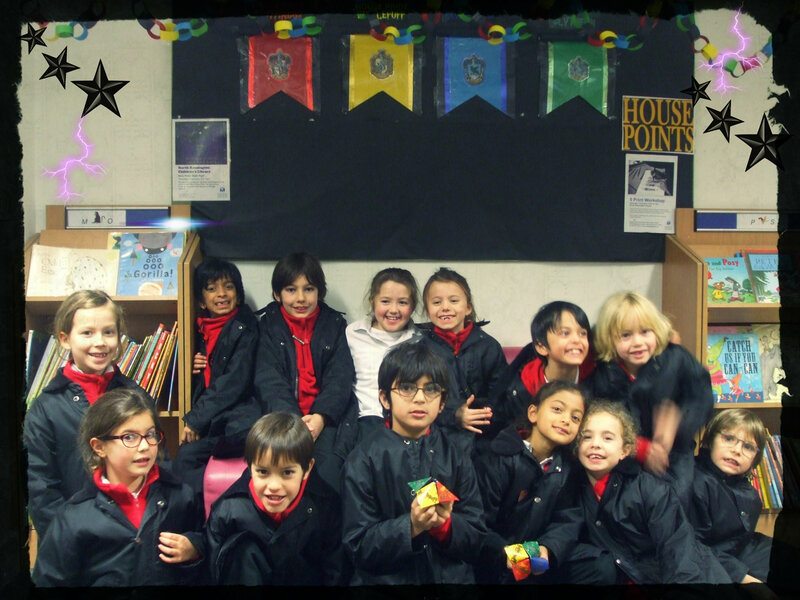 The Sorting Hat ceremony was loud, lots of fun and a great photo opportunity. 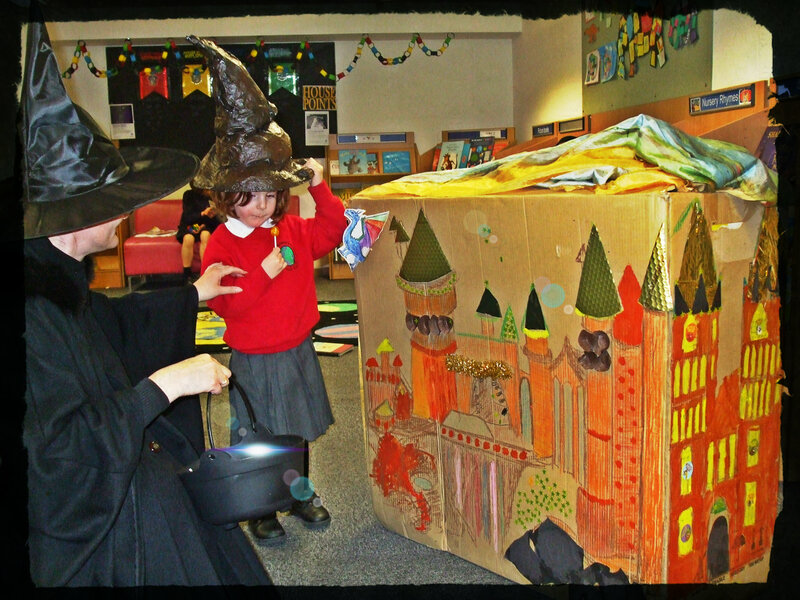 The children were invited to sit on the chair and have the hat placed upon their head before blindly selecting a house from the sorting chest. Once sorted, they were given their house sticker which they wore with pride. 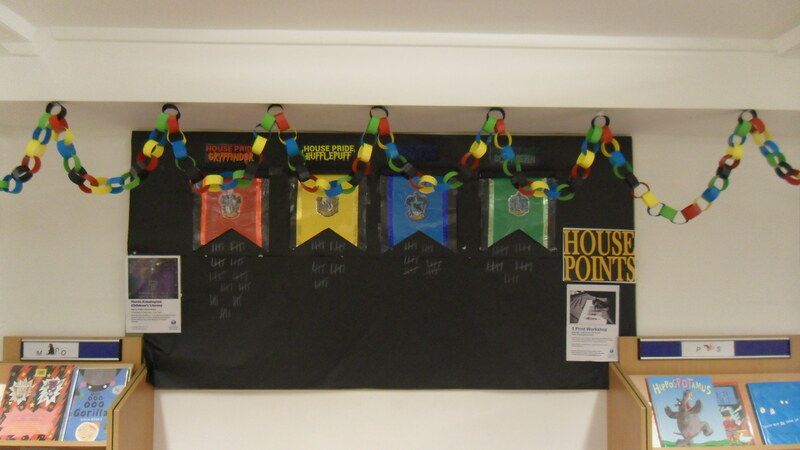 The completion of the Sorting Hat ceremony led into the House Cup Quiz. The quiz turned out to be a really, really, passionate affair with Gryffindor as the ultimate winners. 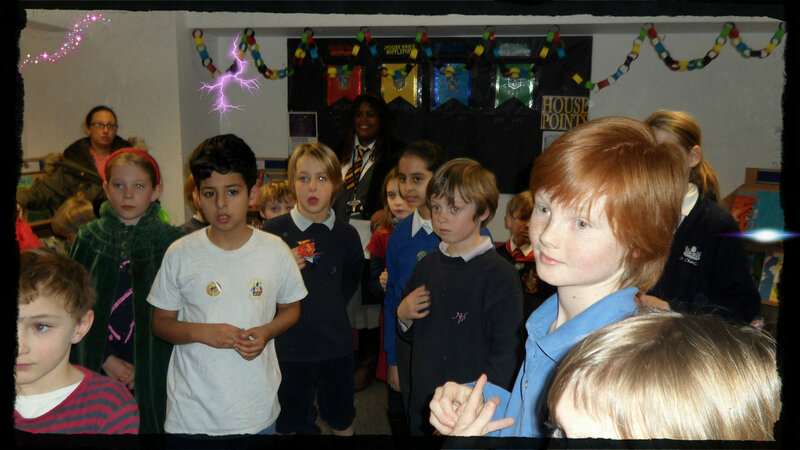 It was amazing to watch how quickly the questions were being answered and how eager each child was to earn points for their house. Next time, we will definitely need harder questions! We were incredibly lucky to host the talented Klaudija Cermak for a special presentation. A specialist in visual digital effects; some of Klaudija’s credits include work on two Harry Potter films, “Harry Potter and the Chamber of Secrets” and “Harry Potter and the Deathly Hallows Part I”. In the “Chamber of Secrets”, Moaning Myrtle, the ghost that haunts the girls’ bathroom, was her main responsibility. Klaudija revealed that she had initially been asked to work on the digital effects for the spiders but had to decline due to her arachnophobia. In the seventh film, Klaudija was responsible for the wand fighting scene between Harry, Ron and Hermione and the Death Eaters in the café. It was interesting to hear how the director would first share his vision, resulting in different processes and techniques she would then employ in order to create a product that everyone was satisfied with. The films “Troy” and “Gladiator” also appear on Klaudija’s long credit list and when briefly mentioned, Zvezdana was quick to point out that most of the audience were still restricted to U and PG certificates, much to everyone’s amusement. It was a brilliant experience and I’m already planning for next year! On a grey, wet Monday lunchtime some of our more hardy readers braved the weather to attend Brompton library’s first Knit and Natter course. This is the first time we’ve run more than a one-off taster session on any subject (apart from Computing for Beginners on Saturday mornings). Our Knit and Natter course lasts for 8 weeks and this was the introduction. Michelle, the tutor from Westminster Adult Education Services, came prepared with wool and needles if necessary but our learners had jumped the gun and came with their own lovely wool – including bright red, black and some sparkly, purple wool that looked like tinsel! At their first session they went away with something they could wear, a beautiful, rose-shaped corsage. There are still places available for this so if you’re free on Mondays from 12 – 2pm this is a great way to spend the time – in good company, learning something new (or refreshing old skills) and with something to take away to show for it. We are hoping to host more events with WAES and make Brompton into more of a place for people to meet up, learn new things and maybe make new friends so watch this space (and the next events brochure)! The summer holidays drew to a close last week and with it ended this year’s summer reading challenge…and what a challenge it was! We had Medusas at Chelsea, sea monsters at Brompton, yetis and unicorns all over the place: all kinds of weird and wonderful fantasy creatures appearing across the borough. This year saw hundreds of children taking part, and almost all completing the challenge and triumphantly taking home their SRC certificates. 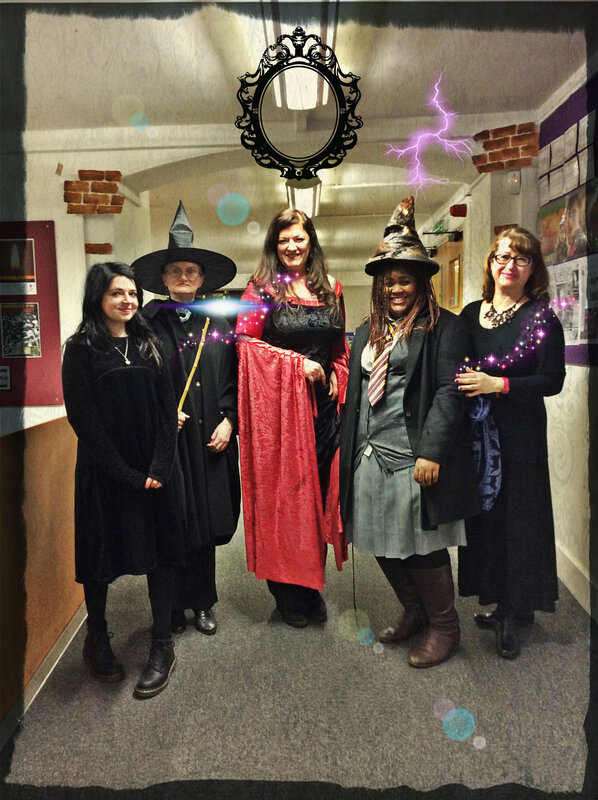 A huge well done to them all…and what have our staff got to say about their Mythical maze experiences? This is my third year of being involved in the Summer Reading Challenge and feel like an old hand now! 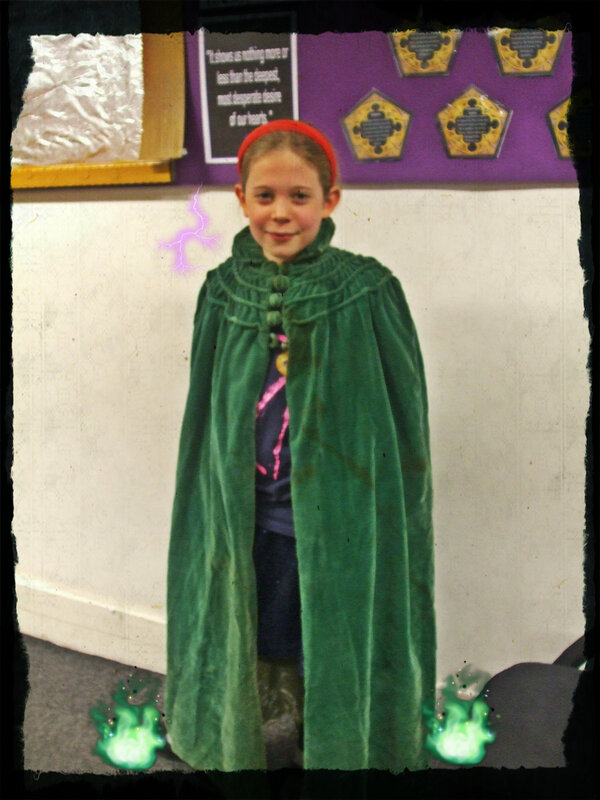 The Mythical Maze theme was really popular with the kids and they loved their own Maze and getting the stickers. The rewards were better this year and, for those who knew how to fold them, the fortune tellers went down very well – I think all the staff were accosted by children wanting to tell their fortunes! We’ve been helped this year (as in previous years) by some really great volunteers, 3 of whom have been with us at least once before and our newbies have done really well at engaging the kids – we’d have been really hard pressed without them! Here at Brompton we were all a bit worried that we’d set the bar quite high last year and wouldn’t get the same level of participation this year but so far we have even more starters and finishers than last year, and we’re still counting! Our finishers are now looking forward to the party later in the month. Yes, don’t forget the summer reading challenge finisher’s party- coming soon to a library near you! I was extremely impressed by the new iPad sessions that were introduced this summer. It is great to promote new technology in libraries and in turn see it become more modernised. 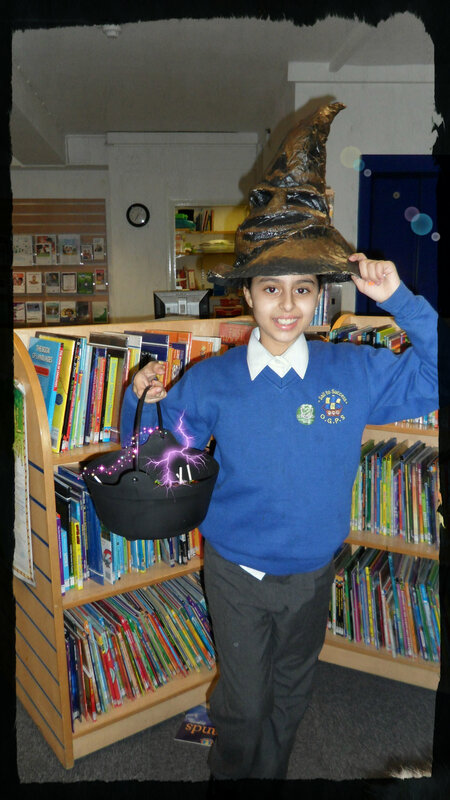 The children very visibly enjoyed exploring the library with the iPads, trying to scan all of the characters and discovering the challenging games in the app. As I have been volunteering for a couple of summers, people often ask me why do I keep coming back. The answer is simple. 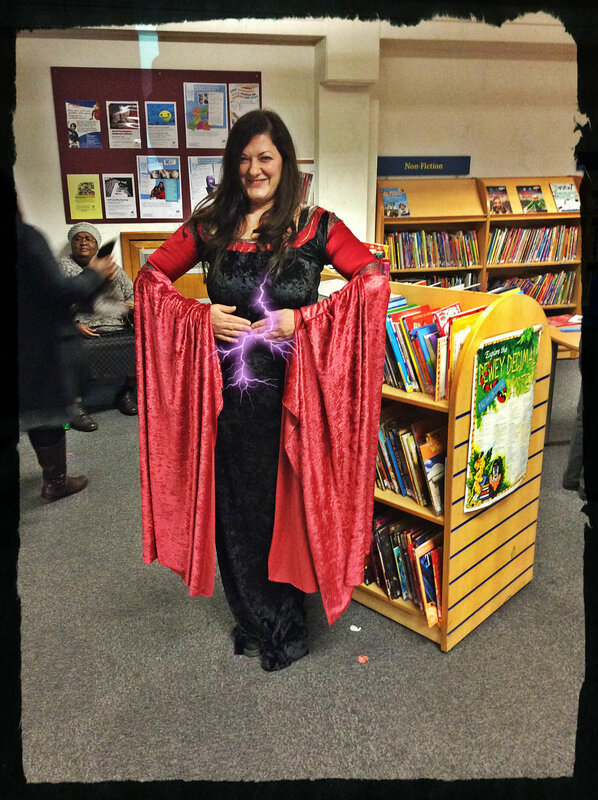 I do it to promote reading skills, I do it for the joy on children’s faces and I do it for all the lovely librarians. And I hope to keep doing it for many more summers to come! The Mythical Maze app was a great bonus this year- it (literally!) brought the monsters alive! Dozens of volunteers signed up before the beginning of summer to help out in the borough’s libraries. They were here for one specific purpose – the summer reading challenge! Once accepting the challenge, and receiving a maze poster, there were prizes for entrants to win along the way. For each book there was the chance to win scratch and sniff stickers (thankfully not as smelly as last year! ), wristbands, keychains and a maze puzzle – which folds into a chatterbox. On completing 6 books, challengers received a gold medal and certificate! Staff, volunteers, and of course the children all had great fun with the summer reading challenge this year- it’s been creative, exciting, and, well, monstrous and mythical! This month in Chelsea Library I have been engrossed in Lucy Hughes-Hallet’s biography of Gabriel D’Annunzio, The Pike: Poet, Seducer and Preacher of War . We can learn a lot about PR and customer service from D’Annunzio, a flamboyant and incendiary public speaker. He would certainly know how to increase cyber traffic! A lover of woman and bric-a-brac (although the bric-a-brac probably came first) he mingled warfare with self-promotion, managing on an early bombing raid above Trieste to drop bombs and pamphlets of his poetry. What D’Annunzio teaches us is to make our lives into works of art. Every gesture, every pose, must be carefully thought out. Reading his book I’ve picked up the following tips: always wear pressed white shirts, arrive by plane or on horseback for business meetings, conduct your love affairs in the public eye and, if you have a new book out, concoct rumours of your own early death to boost sales. The book at over 600 pages is a tall order for a three week read and the hold list is growing longer. Many of our readers coming back to borrow it for a second time to get to grips with this extraordinary individual. The coffee morning is growing and we have many regulars with interests ranging from writing poetry and jazz to painting watercolours. People bake their own cakes so please spread the word if you know of anyone in need of a cup of coffee and slice of cake on Wednesdays at 10.30. 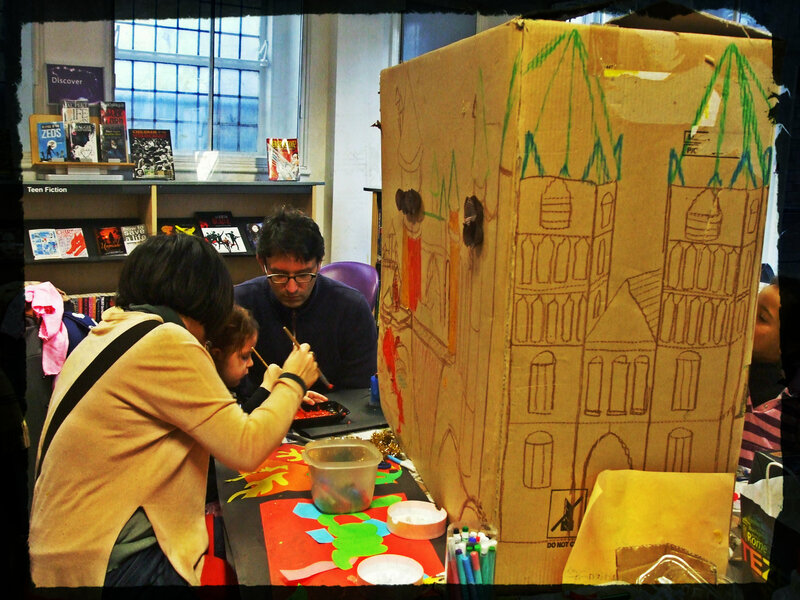 There are plenty of activities for all- our weekly events now include a read and create session on Saturday afternoon, in the past we have made pigs and sunflowers! Don’t forget that we are still running our under 5’s music event, Electric Babyland (aka Baby Rhyme Time), in the children’s library. Over 150 mothers and children come to wriggle and fall over to the primitive sound of Wild Thing and The Wheels on the Bus on Thursday mornings at 11.00am. Please join us! 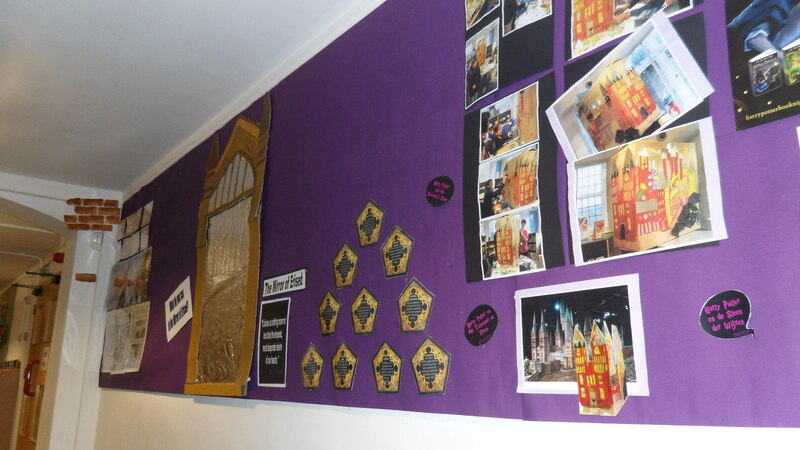 For more information about our services and activities for children, take a look at the children’s pages on our website.